"Put Your Captain's Name In It"
An old sea-captain lay dying in his cabin in mid-ocean, death staring him in the face. He shrank back in the presence of "the King of Terrors", and the dread of Eternity took fast hold upon him. Captain Coutts sent for his first mate, and said: "Williams, please get down on your knees and pray for a fellow. I have been very wicked, as you know, and I expect I shall go this time". "I am not a praying man, Captain; so I can't pray. I would if I could". "Well, then, bring a Bible and read me a bit, for my rope is about run out". "I have no Bible, Captain, you know, I am not a religious man". "Then send for Thomas, the second mate", said the Captain – "perhaps he can pray a bit". The second mate was soon in the presence of his dying Captain, who said to Him: "I say, Thomas, I am afraid I am bound for Eternity this trip; get down and pray for me. Ask God to have mercy on my poor soul". "I would gladly do it to oblige you, Captain – if I could; but I have not prayed since I was a lad". "Have you a Bible, then, to read to me"? "No, Captain, I have no Bible". Alas! for the poor Captain. How awful his condition – on the brink of Eternity and without Christ. They searched the ship over for a man who could pray, but they searched in vain: and for a Bible, but one could not be found until one of the sailors told the Captain he had seen a book that looked like a Bible in the hands of the cook's boy, a little fellow named Willie Platt. "Send at once", said the Captain, "and see if the boy has a Bible". 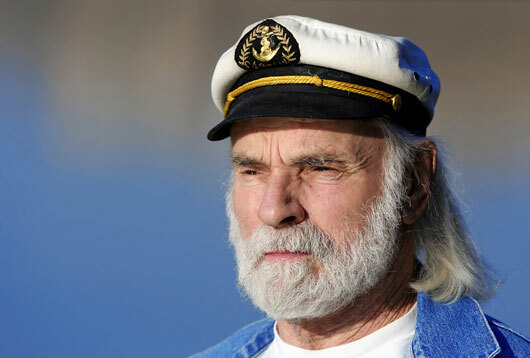 The sailor hurried off to find Willie, and said to him – "Sonny, have you a Bible"? "Yes, sir, but I only read it in my own time". "Oh, that's all right, my lad; take the Bible and go to the Captain's cabin. He is very sick and wants a Bible – thinks he is going to die". Away went Willie with his Bible to the Captain's cabin. "Have you a Bible, my boy"? "Then sit down, and find something in it that will help me, for I am afraid I am going to die. Find something about God having mercy on a sinner like me – and read it to me". 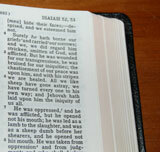 Well, there was one chapter he and his mother loved – Isaiah 53 – and often had they read it together. So Willie turned to that blessed chapter that so fully sets forth the love and mercy of the Lord Jesus Christ, in dying for such as John Coutts; and began to read. 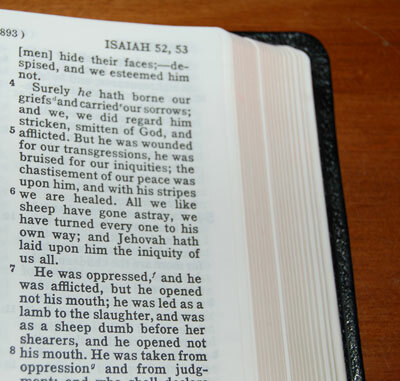 When he got to the fifth verse – "He was wounded for our transgressions, he was bruised for our iniquities: the chastisement of our peace was upon Him; and by His stripes we are healed" – the Captain, who was listening intently, said, "Stop, my boy, that sounds like it; read it again". Once more, the boy read over the blessed words, "He was wounded for our transgressions". "Ay, my lad, that's good – that's it for sure". These words from the Captain encouraged Willie, and he said, "Captain, when I was reading that verse at home, mother made me put my name in it. May I put it in now"? "Certainly, sonny; put your name in it just as your mother told you, and read it again". Reverently and slowly, the boy read the verse: "He – Jesus – was wounded for Willie Platt's transgressions – He was bruised for Willie Platt's iniquities" – and so on. When Willie had finished, the Captain was half-way over the side of the bed, and reaching toward the lad he said, "My boy, put your Captain's name in the verse and read it again". Then the lad slowly read the verse again: "He was wounded for John Coutts' transgressions"; "He was bruised for John Coutts' iniquities", "The chastisement of John Coutts' peace was upon Him", "and by His stripes John Coutts is healed". When Willie had finished, the Captain said, "That will do, my lad, you may go now". Then the Captain lay back on his pillow and repeated over and over again those precious words of Isaiah 53:5, putting in his own name each time, and as he did so, the joy of heaven filled his soul – he was saved! Yes, praise the Lord, he was saved! Another poor sinner saved, for whom Jesus died. The soul of Captain Coutts soon passed away. His body was rolled in canvas, placed upon a plank, and allowed to slide overboard into the water, to be seen no more until Jesus comes and the sea gives up its dead. Before John Coutts fell asleep in Jesus, he had witnessed to every one on his vessel that the Christ of God – the Man of Calvary – was wounded for his transgressions, was bruised for his iniquities, and the chastisement that he so richly deserved had fallen on his Blessed Substitute – and by His stripes – the stripes that fell on Jesus – he, John Coutts, had been healed. Can you, my reader, say the same? Written by George Cutting (1843-1934). 1 Who hath believed our report? and to whom hath the arm of Jehovah been revealed? 2 For he shall grow up before him as a tender sapling, and as a root out of dry ground: he hath no form nor lordliness, and when we see him, there is no beauty that we should desire him. 3 He is despised and left alone of men; a man of sorrows, and acquainted with grief, and like one from whom men hide their faces; —despised, and we esteemed him not. 4 Surely he hath borne our griefs and carried our sorrows; and we, we did regard him stricken, smitten of God and afflicted. 5 But he was wounded for our transgressions, he was bruised for our iniquities; the chastisement of our peace was upon him, and with his stripes we are healed. 6 All we like sheep have gone astray, we have turned every one to his own way; and Jehovah hath laid upon him the iniquity of us all. 7 He was oppressed, and he was afflicted, but he opened not his mouth; he was led as a lamb to the slaughter, and was as a sheep dumb before her shearers, and he opened not his mouth. 8 He was taken from oppression and from judgment; and who shall declare his generation? for he was cut off out of the land of the living; for the transgression of my people was he stricken. 9 And men appointed his grave with the wicked, but he was with the rich in his death, because he had done no violence, neither was there guile in his mouth. 10 Yet it pleased Jehovah to bruise him; he hath subjected him to suffering. When thou shalt make his soul an offering for sin, he shall see a seed, he shall prolong his days, and the pleasure of Jehovah shall prosper in his hand. 11 He shall see of the fruit of the travail of his soul, and shall be satisfied: by his knowledge shall my righteous servant instruct many in righteousness; and he shall bear their iniquities. 12 Therefore will I assign him a portion with the great, and he shall divide the spoil with the strong: because he hath poured out his soul unto death, and was reckoned with the transgressors; and he bore the sin of many, and made intercession for the transgressors. Paid the great debt, and my soul He set free. Oh, it was wonderful – how could it be? Dying for me – for me. "If you confess with your mouth Jesus as Lord, and believe in your heart that God has raised Him from among the dead, you will be saved. ... For whosoever shall call upon the name of the Lord shall be saved." Romans chapter 10, verses 9 to 13. "For God so loved the world that He gave His only-begotten Son, that whosoever believes on Him may not perish, but have life eternal." John chapter 3, verse 16. You, too, can turn to God as John Coutts did. Simply believe in your heart that Jesus Christ died for you and shed His blood to wash away your sins. Ask Jesus to come into your heart, and confess Him as your Lord and Savior. I Met Messiah - Mottel Baleston's video testimony. A Messianic Prophecy - video discussion about Isaiah 53. The Righteous Forsaken - the gospel of Jesus Christ. Jesus Film (English) - story of Jesus' life, in English. Jesus Film (Hebrew) - story of Yeshua's life, in Hebrew. Jesus Film (Modern Arabic) - story of Isa's life, in Arabic. Bible Gateway - online Bible in more than 70 languages. Existence Of God - evidence that God does, indeed, exist. Showers of Blessing - gospel messages and teachings.